Sandwiches being dumped after the papal mass. THE OFFICE OF PUBLIC Works has said that the thousands of sandwiches thrown out after the papal mass were offered to charities who said they were not in a position to accept them. “They explained they were not in a position to accept sandwiches which were 36 and even 48 hours old, no matter how well they were stored in the meantime,” the OPW said in a statement. 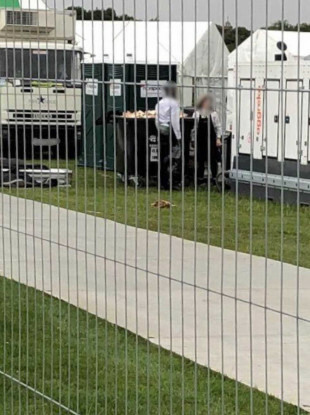 It was responding to a caller on RTÉ’s Liveline who spotted catering staff throwing out unopened sandwiches after the World Meeting of Families closing mass in the Phoenix Park on Sunday. “There was a skip, full of what looked like sandwiches so I kept an eye on it. “Then I saw more staff coming out and throwing more sandwiches into the top of the skip, all brand new unopened sandwiches,” the man told Joe Duffy. He said he was also in view of thousands of pilgrims leaving the main arena and presumed the sandwiches were being disposed of due to being unsold. In response to the man’s query as to why the sandwiches were not donated to charity or given out to pilgrims, the OPW said that before the event and in anticipation of the risk of food waste it contacted a few charities. “Many traders also attempted to have them distributed to charities but were unsuccessful for the same reasons. Many others just gave them away for free to members of the public as they left the site,” the OPW said in a statement. “The rest had to be dumped. It is safe to say that the number of sandwiches dumped was proportional to the difference between expected attendance and actual attendance. It is believed that in Knock, local nuns had leftover sandwiches taken away for distribution to charities. Email “Thousands of sandwiches thrown in skip after Papal Mass because charities refused them says OPW”. Feedback on “Thousands of sandwiches thrown in skip after Papal Mass because charities refused them says OPW”.